John Quinn is a journalist for England's biggest-selling tabloid newspaper, and is about to write the most juiciest story of his career - a kiss-and-tell involving a very powerful man. The deputy prime minister. John's story is sadly taken before he get's chance to interview Lorna Thomas (the kiss-and-tell), when she supposedly kills herself, on a country road. Unable to accept her twin sisters death, Laurie embarks on an adventure to London, stepping right into her sisters footsteps - moving into her home and going into her old job, that's not without having her first encounter with the deputy pm. Charles Lloyd is devastated when he hears of Lorna's death. However, with him being married and a reputation to hold nobody can ever know - he's only regretful he didn't tell Lorna how he truly felt before her passing, and never ended his sham of a marriage to be with her. Meeting Laurie scares the living day lights out of him, it's like staring at Lorna all over again. After holding himself together for so long he feels the only person who understands is Laurie (who knew about the affair) and he's committed in helping her find the truth out about Lorna (Laurie doesn't believe Lorna killed herself). 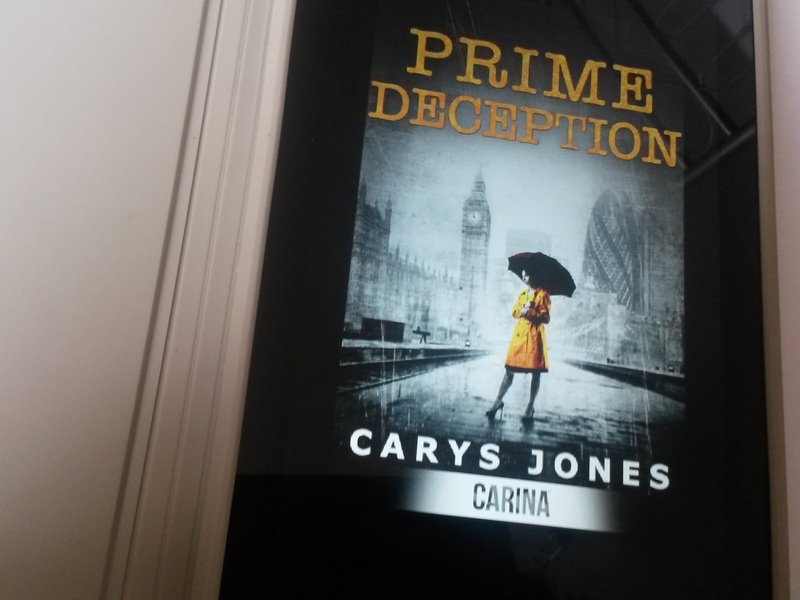 Prime Deception is a short, fast-paced read. It doesn't fall under a certain category and has a little bit of everything going for it, romance, mystery, crime and a sense of adventure. From start to finish I found the novel to be engaging. I just couldn't put it down. Prime Deception is mainly based round by how the characters were feeling rather then the story it's self, though, it does tell a story through the characters eyes. There's Charles who feels guilty and upset about Lorna's passing. Laurie who is now the outsider has the similarities between her and Lorna make it almost impossible for family and friends to engage with her. I'd of much preferred the story to have been extended, they were parts that could of added loads more detail making it an even more exciting read. Carys could of gone into more detail about other characters that actually played a major role in the story line. Saying that, I can't recommend the read enough, it was so good, engaging and hard to put down. I loved the mystery of it all - which wasn't at all easy to work out, and the ending had a major twist that was very unexpected. At one point I had at least three of the characters in the firing line, none that ended up being right. I was hoping for another romance between Laurie and Charles, and I think anyone who reads it kind of hope's it will happen. You can see Laurie's loyalty clearly remains with her sister, and no romance happens. The author did a great job and I'd love to read a full 400+ page book from her. I really look forward to seeing what comes from Carys in the future. I just didn't want this book to end. My giveaway ends in a few hours. Open to anyone living in Europe. Win a charm bracelet from the selection, of your choice here.